For us to be able to evaluate and understand the past 500 years of history and heritage and to navigate issues such as heritage and identity we need to also look back at the distant past and separate what knowledge that we do have now, from propaganda and colonial overlays over the years. To borrow a phrase from an interviewed San survivor in the 19th century – the winds of this understanding, blows from far back in time. If we are led in the present by blatant falsehoods about the past we will cripple ourselves. When it comes to the distant past we certainly don’t know all of the answers and probably never will. It’s a journey of exploration that changes as more and more information comes to light. The distant past cannot simply be explored by one academic discipline either; it is a multi-disciplinary approach that is required – with archaeologists, geneticists, anthropologists, social historians, geologists, oral historians, spiritual practitioners and all that have something to bring to the table of exploration. When it comes to looking at the Cape San or /Xam and the various Khoena tribes of the Eastern and Western Cape in pre-colonial and ancient times there is much muddying of the waters when trendy language, opportunistic political causes and simplistic and sometimes blatantly false or pseudo history paints over important discoveries. Very often it is shortsighted opportunistic political ideologies that obscure or blur our view of the distant past and this robs us and future generations of really important building-blocks in getting to understand and know our society today. Notions of ‘first nationhood’ and mythical San and Khoi ‘kingdoms’ abound and it can be opinioned that these are a distraction and potentially falsify the past and rob us of its real value. Tailoring history, heritage and culture to become a lever in leveraging short term gains is another factor to be aware of and to ensure that we don’t get taken off on opportunistic tangents. With the increasing popularity of dna testing, we should also be cautious about conflating dna (genetics) findings with identity. While it can certainly bring perspective to identity and assist in that manner, the complexity of identity and social history should never be confused with dna results on its own. In genetics they talk of Southern African dna and do not generally specifically reference this as San or Khoisan dna, though some scientists sometimes abbreviate and reference San and Khoisan. The latter are terms that have gained currency in anthropology and archaeology and from there have jumped the tracks into genetics. Of late as there has been reference to dna findings when looking at social history, and also with its fashionable use with genealogy, some are jumping to fundamentalist-style interpreted conclusions. We should be aware of this and cautious of these approaches as we go forward with our explorations. But nonetheless the interdisciplinary observations are important in assisting perspective. This short overview attempts to simplify a trajectory of human and societal development in the territory south of the Gariep before colonial times and before the first encounters between Indigenes and the Europeans. Here we explore how human beings populated Southern Africa and then organized themselves. We need to look at what were points of conflict and where there was peaceful coexistence flourishing. Humans and apes are said to have common ancestry back in the Miocene period around 8-million years ago. Early ancestors of archaic humans can be traced back in various parts of the world from before 2,5 million years ago through markers that they left behind. When we refer to such common ancestry and talk of archaic humans, it must be noted that we are not referring to Homo Sapiens – modern Humanity. We often hear people make sweeping claims that their ancestors occupied the land for millions of years or hundreds of thousands of years, but such statements are not rooted in fact and we must distinguish between early or ancient evolutionary ancestral roots in human evolution and Homo Sapiens (humans). Anatomically modern humans evolved from archaic humans in the middle Paleolithic period about 200 000 years ago in Africa, marking the dawn of the subspecies who are the ancestors of all people in the world. The signs show that this important event took place in East Africa. About 90 000 years ago modern humans started dispersing across Africa in journeys which saw them dispersing across the world. In the context of the territory of South Africa when we talk about “First People” we can only mean habitat by those first Homo Sapiens (modern humans) who moved into the entire Southern African region around 70 000 years ago. Most of these peoples and groupings died out in time. There are signs and remains of the existence in the Southern African region of Archaic Humans or pre Homo Sapiens before this period but this must not be confused with “First People”. 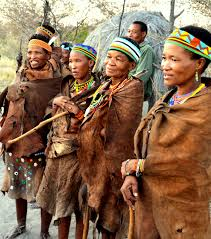 It is from the “First People” or oldest modern human inhabitants of Southern Africa that the forebears of those we now call the San of this region evolved through early and later stone age processes into early and later iron age peoples and into social formations. The first social organization of people to emerge from the “First People” are those archaeologists and anthropologists came to label as the San or Bushmen. Both archaeology and genetic science indicate that advanced social formations who have been given the broad collective name of San or Bushmen and Sadawe and Hadza, emerged from the “First People” around 25 000 to 40 000 years ago in different places across Southern Africa from Angola in the west down to the Southern tip of Africa and from southern Kenya in the east down to the southern tip of Africa, and in much many more formations than those surviving 500 years ago. One of the many different San groups emerged in this period in the southern, eastern and central Cape whom we refer to as the Cape San or /Xam. It is they who are the only people who had “First Habitat” in the region by 2000 years ago. We need to be very careful of using the term ‘Khoena San’ or ‘KhoiSan’ as this anthropological and archaeological term does not do justice to the San in general and to the Cape San or /Xam in particular. The Khoena emerged much later as a social formation through the coming together of migrating pastoralists from East Africa and one San grouping, the Kalahari San. Behar, Soodyall and the Genographic Consortium tell us that in dna terms the forebears of those we refer to as the Cape San (and in part of those who we refer to as the Khoena who emerge as a later social formation) had matrilineal ancestry which diverged from the rest of the human mtDNA pool sometime around 90,000 years ago and that parallel to this there were also at least five other matrilineal lineages arising out of the early Homo Sapiens. Through the same lineage the Khoena social formation are partly from this early lineage but also have other admixture in their dna. The Genographic Consortium also establish that an estimated minimum of 40 other evolutionarily successful lineages ﬂourished in sub-Saharan Africa as well during the period of modern human dispersal 60,000 –70,000 years ago. By 2500 years ago San as social groups of people were but the remnants of those diverse “First People”. Traces of San lineages were also shared in admixtures of other sub-Saharan African peoples. The scientists also further say that only much later, at the beginning of the Late Stone Age, about 40,000 years ago did introgression of additional lineages occur into the mtDNA pool of San forebears and that these processes were further accelerated when other East African, (with some Nilotic roots) and Sub-Saharan African (Bantu also with some Niolitic roots) dna entered the mix during the periods of different East African and siNtu speaker (Bantu)migratory engagements on the periphery of the Kalahari from around 2,500 years ago. It is thus only 2 500 years ago when the Khoena as a social formation first emerged with strong dna shared with the same forebears of the Kalahari San (rather than the Cape San or /Xam, but also with other dna markers. This period marks the period of contact between the Kalahari San hunter-gatherers and external migrants who kept sheep and cattle and drank milk. These external elements had dna markers passed on to Kalahari San which point to Sandawe and Hadza from East African descendants of “First People”. But they also show dna from “Nilotic People” from the Nile region of North Africa. And sub-Saharan Africans (Bantu). It is from this engagement of North, East and South that sheep farming pastoralism and the Khoena or Khoi people emerged in the Kalahari and migrated to various parts of South Africa. demonstrates advanced mining and beneficiation crafting skills. The Mapangubwe, Great Zimbabwe, Thulamela and hundreds of other sites point to a large African civilization in the region where its peopling is a complex make-up of San, Khoena, and peoples with dna roots in North, West and East Africa…. And perhaps elsewhere too as some of these sites in all likelihood had direct contact with Arab and Chinese traders. From dna testing there is also ample evidence that the Lembe in this region have origins with people of the middle east, namely the Jews. As much as the early Khoena moved out of the Kalahari to engage with other peoples and as founders in this Southern African Kingdom, they also trekked from this region via the Gariep into the Eastern and Southern territories occupied exclusively by the Cape San or /Xam and were the first external pastoral-herder people that interacted with the southern /Xam hunter-gathers. The Khoena live side by side with the San in the Kalahari and gradually moved down from the Kalahari to the Gariep River and to southern Namibia where other unrelated San groups also had habitat. Here in this new region social identities (clans and tribes) began to form within the San and within the Khoena. It is from here too that the Khoena would gradually migrate to the Eastern Cape and then on to the Western Cape. In this migratory process new Khoena social formations or tribes would occur. In time and for various reasons some of these formations would also disappear. The Khoena would also meet the Cape San or /Xam to whom they were not initially related, but with whom some limited relations would have later developed. As pastoralists and herders and to some degree agriculturalists they would also develop antagonisms with the San too and over time displaced the San from the coastal territories to the mountainous territories. It is likely too that others from this expansive African civilization with its mixed inhabitants must have done some travelling Southwards and that there are likely to have been trading links with the Khoena from this time already. It is clear that early siNtu speaking Sub-Saharan African migrants going eastwards would have initially been fairly weak and in small formations in the beginning, also took on the mtdna markers of the San people and Khoena. This occurred long before later Nguni arrived across the Kei and Keiskamma by the 15th century. It is most possible that this is the roots of the early Xhosa rather than their earliest beginning being with the later Nguni migratory drift. The impact of the Khoena and San on the language and culture of the early Xhosa, and indeed on their very name, is too profound to have happened at the time of the arrivals of the Mpondo, abeThembu and Mpondomise. In recent times social scientists and dna scientists have worked more closely together than before and particularly with the advances in genetics, more and more evidence is emerging that clearly shows that the San were not as isolated from other influences than previously thought. As already mentioned sheep which were not indigenous to Southern Africa seem to have been introduced from North Africa and the Middle East via East Africa. We are challenged to look past the paradigm of thinking that through the dominant colonial lens locks San and Khoena people into primitivism for all time. European denialism of the great African civilization across Southern Africa a long time before their arrival should cease to be the guiding star that many have allowed it to be on their thinking. Lots of new indicators are constantly emerging. For instance in 2014, Dr Carina Schlebusch, a foremost geneticist, found in her studies a hard Khoena link to East Africa that points to a journey from East Africa over 2000 years ago by following milk markers in the Khoena dna – Allele LP-SNP 14010G. This in turn shows a link to Niolitic North Africa and the Middle East. The presence too of the Lembe, with their strong Jewish culture and dna markers, in Limpopo also points to a middle East connection. More and more evidence also emerges of old trading networks between the Khoena up through to far off lands to the North and East.Social historians have also been more rigorously engaging with archaeologists, anthropologists and geneticists in recent times. Melanie Yap and Dianne Leong Man, in their book Colour, Confusion and Concessions – the history of the Chinese in South Africa give us an insight into China’s early engagement with Africa from the Han dynasty to the T’ang dynasty (208AD to 907AD) and from the Sung dynasty (960 – 1279) to the Ming dynasty (1368 to 1644). This involves both direct Chinese engagement and trade engagement via the Arab traders. Indeed even prior to the Ming dynasty in 1320 the Chinese had already mapped South Africa recognizably at a time when in Europe their maps of Africa stopped in the middle of the continent without any knowledge of its southern shape. By 1402 Ch’uan Chin’s Chinese map showed the Gariep River (Orange River). Admiral Zheng He between 1405 and 1433 carried out seven expeditions to Africa in the Indian Ocean in much larger ships equipped for scientific study than the Europeans had at the time and brought back a Giraffe to China. At both Great Zimbabwe and at Mapangubwe porcelain from the Sung dynasty has been found and this predates any European linkages by 600 to 700 years. Yap and Leong Man point out too that anthropologists point out old San paintings in the Eastern Cape show that there was interaction between Chinese and San people. This fits in with Chinese tales that prior to 1300 the Mazi from China were frequent visitors to the East Coast and that it is likely that there were shipwrecks and survivors of those wrecks who may have integrated with the San. These survivors were called Awatwa and there are stories that the Basotho hats have their origin with the Chinese hats of the same design. Tyap and Leong Man mention that the so-named “Snese Hottentots” as well as the Bahurutsi tribe in Botswana are two groups who may have had engagement with Chinese whether overland travelers or maroons from shipwrecks. Exploration of social history that connects the South of Africa to the peoples of the world has not kept up with the hard sciences but is now playing catch up.. One thing is clear is that we have to keep open minds and need to move out of existing dominant paradigms of thinking when exploring the social history of the Khoena and San of South Africa. Those who today have charicatures of Khoena and San as handed down to them by colonists are not doing the true history of these people any favour by mimicking colonists views of the Khoena and San who have been stereotyoed in a primitivist mould. Archaeological and DNA studies are constantly providing new evidence, and as a result, new perspectives and schools of thought often arise concerning the origins of the Khoena people of South Africa in particularly and their various modes of living and social and economic activity. It is thus important that we note that the Khoena or Khoi people do not originate in the Western Cape, but migrated to the Western Cape over a probable 600 – 1000 year period in a slow migratory drift from the Gariep. Prior to their presence at the Gariep they migrated from the vicinity of the Kalahari perimeter. The larger part of the migration was through the Eastern Cape and another slower migration down the West Coast. Along these journeys through a process of multiplication of tribes by division of tribes, a footprint was left throughout the route in the form of inter-related tribes most of whom existed by the time of the European arrivals. The earliest Xhosa probably were fellow travelers of the Khoena to the Eastern Cape and were highly influenced by Khoena and San and shared some dna markers. These early Xhosa were more highly impacted upon by the later movement into the Eastern Cape by the Nguni groups that shaped the modern Xhosa. The Nguni themselves were a South African people who emerged from the coming together in Natal of Bakoni moving out from the Mapangubwe Kingdom and the Tsonga from Mozambique and the San who lived in KZN. The Nguni who gradually drifted southwards and met up with the early Xhosa and the Cobhuqua Khoena were the abeThembu, Mpondo and Mpondomise. But it is also said that people such as the AmaNgqosini from the Lesotho region and further from the Gariep Korana also later engaged the Xhosa and AbeThembu too. In the migratory journey the Khoena, Xhosa and the Cape San interacted with each other and each left a mark on the other. So in the migratory period the Khoena had relations of various sorts with the original Cape San inhabitants of the Eastern, Central and Western Cape including conflictual relations. While some close relationships occurred this was not the norm and it undermines the history and heritage of the social formations of the Southermost San, the /Xam when people use the anthropological and archaeological term Khoisan as though it refers to social formations of people. There is a difference between social history and scientific observations of ancient origins – a difference between social heritage or identity and dna readings or archaeological findings. When one looks at the history genocidal attacks of Khoena (Khoi) on the San then it is insult upon injury to refer to Khoisan as a social formation in history. Relations in the Eastern Cape were marked by pastoral encroachment and friction on the one hand first by Khoena pastoralists, followed by early Xhosa pastoralists, and then by later Nguni pastoralists. But it must also be recognized that degrees of inter-marriage, social engagement or sexual relations also impacted each on the other. Degrees of assimilation took place. Between all four groups and assimilation was not always characterized by force or conquest. Thus we must also be very careful not to think in a rigid purist ethnic silo manner. The Cape San or /Xam had already been living across the Eastern, Western and Central Cape areas for centuries before the Khoena (Khoi) migrants, the early Xhosa migrants or later Nguni migrants arrived with their pastoral culture. The Cape San or /Xam were the only social group who had first habitat before all of these groups throughout the entire Cape. The Cape San or /Xam precede the arrival of Khoena pastoralists by a few thousand years. The fact that the Khoena pastoralists had dna marker roots that in large part joined up with the Kalahari San long before, does not mean that they were the same social group as the Cape San hunter-gathers of the new regions that they entered. It was Khoena pastoralism before any other that resulted in displacement of Cape san or /Xam away from the coastal areas and into the mountains and drier regions. But all of this was absolutely insignificant in its effects on large populations of all groups in the territory to the impact of the Europeans which later brought genocide, war and destruction to all. The hegemony of pastoralism brought into the Southern Cape arena first by the Khoena and then by the Xhosa displaced the hunter-gatherer culture, but in some areas pastoralist and hunter-gatherers co-existed side by side. The later Nguni pastoralist migrations of abeThembu, Mpondo, Mpondomise and others had further influence on social formations and on habitat of the Cape San. To a much lesser degree it also had some influence also on the Khoena. It is over 600 – 1000 years that the Southern Khoena developed sustainable and cohesive communities which were resilient and strong enough to continue in existence throughout the migration processes of the Nguni. When Khoena pastoral communities grew too large and livestock plentiful, communities split off and moved ever further south. There are no overt signs that the development of these community formations was as a result of any huge antagonistic and violent clashes. There certainly would have been a degree of friction and probable skirmishes that would be natural in such breakaways. But nothing as large, absolute, deliberately planned and devastating as that of the European invasion, ethnic cleansing, and genocide carried out over two centuries first on the Khoena, then on the San and then on the Xhosa-Khoena, Xhosa and other eastern Cape peoples. Each pastoral community were relatively well settled and had systems of livestock grazing that was rotational and weather-observant. Elphick tells us that signs are there that suggest there was a communication chain and trading chain that could be tracked from the southernmost communities right through to the Gariep, to the Mapangubwe and Great Zimbabwe regions and beyond to the far off north. This migration drift of the Khoena ending in the Southwestern Cape would have been complete long before the end of the 14th century. The Eastern migration drift and the Western migration drift from the Namaqua and resulting in Guriqua were also completed long before the first European arrivals. There are anecdotal accounts were that once there had been a mixed Khoena-Xhosa people called the Cobuqua people who by the time of the arrival of the Europeans existed no more than only in oral history accounts. Some of these mixed Khoena-Xhosa were likely to have been pushed southwards by the arrivals of Nguni. The abeThembu,, the Mpondo, the Mpondomise and others impacted on the descendants of the original Xhosa and Khoena. The mix of Cobuquq and original Xhosa- Khoena moved southwards to the Zuurveld where they joined up with Inqua refugees and the Gonaqua. Here they formed the Gqnukwebe. (Gonaqua-Kwebe became Gqnukwebe) At the time of the arrival these Gonaqua Xhosa and the Gonaqua themselves fought in resistance together against the Europeans. One thinks here of the alliance between Chiefs Chungwa and Klaas and David Stuurman. The highly Nguni influenced remnant Xhosa that remained alongside the abeThembu saw a Kingdom, the house of Phalo emerge. It would later split into new Xhosa polity’s – the Rharabe and Gqaika. It was in the context of a clash between two contenders for the Xhosa leadership that the Inqua Khoena tribe made a huge miscalculation resulting in their demise. They took a decision to back the losing contender and as a result were consumed by the House of Phalo. Some became refugees and were incorporated into the older Xhosa-Khoena Gqnukwebe which were eventually incorporated into the Rharabe.. It is unfortunate and a corruption of the facts and complexities of interactions between Nguni and original Xhosa, and Khoena, San and mixed Khoena-Xhosa in the Eastern Cape that these events long before the arrival of the Europeans, are presented crudely in the European narrative as a violent ‘black’ invasion that destroyed the Khoena and San in the territory of the South Eastern Cape. The Europeans have always argued that they did not force out the Khoena or wipe out the Cape San and have presented ahistorical accounts of a relatively people-free land in which previous inhabitants were wiped out by black invaders from the north. This is blatantly untrue. As has also been shown, the Khoena and San had already been involved in relations with Sub-Saharan Africans at Mapangubwe and indeed held exalted status within the Mapangubwe Kingdom. By the time that the Europeans arrived at the Cape the scenario in the Zuurveld of the Eastern Cape was fairly settled. Khoena and Xhosa-Khoena formations were living side by side in prosperity. From Table Bay to the Zuurveld and to the Gariep was home to an estimated 200 000 Khoena. The Khoena alone had hundreds of thousand sheep and cattle and were successful farmers. The Cape San or /Xam lived beyond the seaboard territories in the mountainous areas and numbered in the region of 30 000. To the South beyond the Gonaqua there were many Khoena tribal formation right down into the Cape Peninsula that were prosperous sheep and cattle farmers – Hoengeyqua, Gamtoos, Hessequa, Outaniqua, Attaqua, Chainouqua, Cochouqua, Goringhaiqua, Gorachouqua, Goringhaicona, Guriqua and other smaller offshoots of these. On the western seaboard and inland were the Guriqua or Grigriqua also known as the Chariguriqua, and then the Namaqua. The ethnocide visited on these peoples by the Europeans is well recorded. The genocide against the Cape San or /Xam is also well recorded. The violent expulsion of Indigenes and the destruction of their social infrastructure and their economy was a crime against humanity. Once conquering Indigenes those who were not killed or escaped northwards as refugees were turned into farm labourers little different to slavery while others were conscripted into militia called Commandos. The pacified Khoena were turned into efficient killing machines in these Commandos and were effectively used in the genocide campaigns against the free resisting Indigenes. IN BRIEF SUMMARY: One thing that is agreed among inter-disciplinary scholars who have studied the Khoena is that events of catalytic importance happened around 2,200 – 2,500 years ago in the region of the Kalahari and it’s perimeter (also called the Northwest Circle) in Southern Africa whereby one branch of the San were engaged by external forces from East Africa with older links to North Africa and beyond which gave birth to the Khoena of the Kalahari and perimeter. There is also now agreement that the hidden history of the Mapangubwe civilization involved the Khoena and San and Sub-Saharan Africans from various origins in union with each other and that further study and the listening to oral history throws a whole new perspective on everything in terms of appreciating the Social-History of the peopling of South Africa before colonial times. By the time of the European first exploratory arrivals the Khoena had firm habitat in the Eastern and Western Cape.. Note on the terms Bantu, Khoena (or Khoi) and /Xam or San: All of these terms have the same meaning and literally mean “PEOPLE” each used in a different culture. Scholars have given the terms added meaning to differentiate families of different peoples by linking these to linguistics and to different African lineages linked to dna. Thus the linguistic term for people – “Bantu” was linked to those who have Sub-Saharan African dna who migrated into and out of the Great Lakes region. The Linguistic term for people, “/Xam” or “San” (the latter having the additional meaning denoting ‘forager’), was applied to those who have Southern African dna; and the linguistic term for people – “Khoena” or “Khoi” was applied to a new more modern people who had a mix of Southern African and East African/Niolitic dna and had adopted pastoralism. We should not get hung-up on terms because as we dig deeper they have less of the socio-political meaning that they have come to acquire over time. All of these peoples are African and indigenous to Africa. The complexities and the depth of highly developed African societies with social histories that interface with South Africa are now also coming to light after a long period of suppression by Christo-European intellectual hegemony, responsible for the destruction of African civilisations and, for papering over huge elements of a challenging African past. The evolution of Khoena social history over this migration requires much more collection of evidence and research. For instance the interaction between the Khoena and the old African centres of trade and development at Great Zimbabwe and Mapangubwe, or with the fascinating Lembe would be interesting to explore. The gaps in social history must be explored and a challenge exists around notions of ‘primitivism’ and the European concept of ‘the noble savage’ which has strongly been overlaid on Khoena society and unfortunately has been adopted by some elements who then lock Khoena culture in a time capsule. This when linked to skewed histories based in what I call the ‘Great Lie’ (the story of a major ‘black’ invasion that destroyed indigene Khoena and San) distort the entire San and Khoena story. Lactase persistence alleles reveal ancestry of southern African Khoe pastoralists; Uppsala Bio Life Science Pathfinder on work of Dr Carina Schlebusch [journal/ April] (2014). The Chronological Evidence for the Introduction of Domestic Stock into Southern Africa; Bousman, C. Britt; The African Archaeological Review; (1998). Colour, Confusion and Concessions – The history of the Chinese in South Africa by Melanie Yap and Dianne Leong Man; Hong Kong Universit Press; 1996. MtDNA control region variation affirms diversity and deep sub-structure in populations from Southern Africa, by Karina M. Schlabusch et al. BMC Evolutionary Biology (2013). If we are led in the present by blatant falsehoods about the past we will cripple ourselves. When it comes to the distant past we certainly don’t know all of the answers and probably never will. It’s a journey of exploration that changes as more and more information comes to light. The distant past cannot simply be explored by one academic discipline either; it is a multi-disciplinary approach that is required – with archaeologists, geneticists, anthropologists, social historians, geologists and all that have something to bring to the table of exploration. When it comes to looking at the Cape San or /Xam and the various Khoena tribes of the Eastern and Western Cape in pre-colonial and ancient times there is much muddying of the waters when trendy language and simplistic and sometimes blatantly false or pseudo history paints over important discoveries. Very often it is political ideologies that obscure or blur our view of the distant past and this robs us and future generations of really important building-blocks in getting to understand and know our society today. Notions of ‘first nationhood’ and mythical ‘kingdoms’ abound as they always have and it can be opinioned that these are a distraction and potentially falsify the past and rob us of its real value.. Tailoring history, heritage and culture to become a lever in leveraging short term gains is another factor to be aware of and to ensure that we don’t get taken off on opportunistic tangents. We often hear people make sweeping claims that their ancestors occupied the land for millions of years or hundreds of thousands of years, but such statements are not rooted in fact and we must distinguish between early or ancient ancestoral roots in human evolution and Homo Sapiens (humans). Anatomically modern humans evolved from archaic humans in the middle palaeolithic period about 200 000 years ago in Africa, marking the dawn of the subspecies who are the ancestors of all people in the world. The signs show that this important event took place in East Africa. About 90 000 years ago modern humans started dispersing across Africa in journeys which saw them dispersing across the world. In the context of the territory of South Africa when we talk about “First People” we can only mean habitat by those first Homo Sapiens (modern humans) who moved into the entire Southern African region around 70 000 years ago. There are signs and remains of the existence in the Southern African region of Archaic Humans or pre Homo Sapiens before this period but this must not be confused with “First People”. It is from the “First People” or oldest modern human inhabitants of Southern Africa that humans of this region evolved through early and later stone age processes into early and later iron age peoples and into social formations. The first social organization of people to emerge from the first people are those we call the San. Both archaeology and genetic science indicate that advanced social formations who have been given the broad collective name of San or Bushmen and Sadawe and Hadza, emerged from the “First People” around 25 000 to 40 000 years ago in different places across Southern Africa from Angola in the west down to the Southern tip of Africa and from southern Kenya in the east down to the southern tip of Africa..
One of the many different San groups emerged in this period in the southern, eastern and central Cape whom we refer to as the Cape San or /Xam. It is they who are the only people who had first habitat in the region. We need to be very careful of using the term ‘Khoena San’ or ‘KhoiSan’ as this does not do justice to the San in general and to the Cape San or /Xam in particular. The Khoena emerged much later through the coming together of migrating pastoralists and one San grouping, the Kalahari San. Behar, Soodyall and the Genographic Consortium tell us that in dna terms the forebears of those we refer to as the Cape San (and in part of those who we refer to as the Khoena who emerge as a later social formation) had matrilineal ancestry which diverged from the rest of the human mtDNA pool sometime around 90,000 years ago and that parallel to this there were also at least five other matrilineal lineages arising out of the “First People”. By 2500 years ago San as social groups of people were but the remnants of those diverse “First People”. Traces of San lineages were also shared in admixtures of other sub-Saharan peoples. The scientists also further say that only much later, at the beginning of the Late Stone Age, about 40,000 years ago did introgression of additional lineages occur into the mtDNA pool of San forebears and that these processes were further accelerated when other East African, (& Nilotic) and Sub-Saharan (Bantu) dna entered the mix during the periods of different East African and siNtu speaker (Bantu) engagements on the periphery of the Kalahari from around 2,500 years ago. It is thus only 2 500 years ago when the Khoena first emerged with strong dna shared with the same forebears of the Kalahari San but also with other dna markers. This period marks the period of contact between the Kalahari San hunter-gatherers and external migrants who kept sheep and cattle and drank milk. These external elements had dna markers passed on to Kalahari San which point to Sandawe and Hadza from East African descendants of “First People”. But they also show dna from “Nilotic People” from the Nile region of North Africa. It is from this engagement of North, East and South that sheep farming pastoralism and the Khoena or Khoi people emerged in the Kalahari and migrated to various parts of South Africa. The Khoena would also take on further dna markers as they later came into further contact with siNtu speaking Sub-Saharans probably from 200AD in the Northwestern arena and most certainly around 600 AD in the Eastern Cape. It is clear that early siNtu speaking Sub-Saharan migrants who would have been fairly weak and small formations in the beginning, also took on the mtdna markers of the San people and Khoena. This occurred long before later Nguni arrived across the Kei and Keiskamma by the 15th century. These Khoena would live side by side with the San and gradually moved down from the Kalahari to the Gariep River and to southern Namibia where other San groups had habitat.. Here in this new region social identities began to form within the San and within the Khoena. It is from here too that the Khoena would gradually migrate to the Eastern Cape and then on to the Western Cape. In this migratory process new social formations or tribes would occur. In time and for various reasons some of these formations would also disappear. In recent times social scientists and dna scientists have worked more closely together than before and particularly with the advances in genetics, more and more evidence is emerging that clearly shows that the San may have not been as isolated from other influences than previously thought. As already mentioned sheep which were not indigenous to Southern Africa seem to have been introduced from North Africa and the Middle East via East Africa. We are challenged to look past the paradigm of thinking that locks San and Khoena people into primitivism for all time. The presence too of the Lembe, with their strong Jewish culture and dna markers, in Limpopo also points to a middle East connection. More and more evidence also emerges of old trading networks between the Khoena up through to far off lands to the North and East. Exploration of social history that connects the South of Africa to the peoples of the world has not kept up with the hard sciences. One thing is clear is that we have to keep open minds and need to move out of existing dominant paradigms of thinking when exploring the social history of the Khoena and San of South Africa. Archaeological and DNA studies are constantly providing new evidence, and as a result, new perspectives and schools of thought often arise concerning the origins of the Khoena people of South Africa. It is thus important that we note that the Khoena or Khoi people do not originate in the Western Cape, but migrated to the Western Cape over a probable 600 year period in a slow migratory drift from the Gariep. Prior to their presence at the Gariep they migrated from the vicinity of the Kalahari perimeter. The larger part of the migration was through the Eastern Cape and another slower migration down the West Coast. Along these journeys through a process of multiplication of tribes by division of tribes, a footprint was left throughout the route in the form of inter-related tribes most of whom existed by the time of the European arrivals.. In the same journey the Khoena, Xhosa and the Cape San interacted with each other and each left a mark on the other. So in the migratory period the Khoena had relations of various sorts with the original Cape San inhabitants of the Eastern, Central and Western Cape. These relations were marked by pastoral encroachment and friction on the one hand first by Khoena pastoralists, followed by early Xhosa pastoralists, and then by later Nguni pastoralists. But it must also be recognized that degrees of inter-marriage, social engagement or sexual relations also impacted each on the other. Degrees of assimilation took place. Between all four groups. Thus we must also be very careful not to think in a rigid purist ethnic silo manner. The Cape San or /Xam had already been living across the Eastern, Western and Central Cape areas for centuries before the Khoena, Xhosa or later Nguni arrived with their pastoral culture. They had first habitat before all of these groups throughout the entire Cape. The Cape San or /Xam precede the arrival of Khoena pastoralists by a few thousand years. The fact that the Khoena pastoralists had dna marker roots that in part joined up with the Kalahari San long before, does not mean that they were the same social group as the Cape San hunter-gathers of the new regions that they entered. It was Khoena pastoralism before any other that resulted in displacement of Cape san or /Xam away from the coastal areas and into the mountains and drier regions. The hegemony of pastoralism brought into the Southern Cape arena first by the Khoena and then by the Xhosa displaced the hunter-gatherer culture, but in some areas pastoralist and hunter-gatherers co-existed side by side. The later Nguni pastoralist migrations of abeThembu, Mpondo, Mpondomise and others had further influence on social formations and on habitat of the Cape San. To a much lesser degree it had some influence also on the Khoena. It is over 600 years that the Khoena developed sustainable and cohesive communities which were resilient and strong enough to continue in existence throughout the migration processes of the Nguni. When Khoena pastoral communities grew too large and livestock plentiful, communities split off and moved ever further south. There are no overt signs that the development of these community formations was as a result of any huge antagonistic and violent clashes. There certainly would have been a degree of friction and probable skirmishes that would be natural in such breakaways. But nothing as large, absolute, deliberately planned and devastating as that of the European invasion, ethnic cleansing, and genocide carried out over two centuries first on the Khoena, then on the San and then on the Xhosa-Khoena, Xhosa and other eastern Cape peoples. Each pastoral community were relatively well settled and had systems of livestock grazing that was rotational and weather-observant. Elphick tells us that signs are there that suggest there was a communication chain and trading chain that could be tracked from the southernmost communities right through to the Gariep, and beyond to the far off north. This migration drift of the Khoena ending in the Southwestern Cape would have been complete by the end of the 14th century. The Eastern migration drift and the Western migration drift from the Namaqua and resulting in Guriqua were complete long before the first European arrivals. The anecdotal accounts were that once there had been a mixed Khoena-Xhosa people called the Cobuqua people who by the time of the arrival of the Europeans existed no more than only in oral history accounts.. Some of these mixed Khoena-Xhosa were likely to have been pushed southwards by the arrivals of Nguni. The abeThembu,, the Mpondo, the Mpondomise and others impacted on the descendants of the original Xhosa and Khoena. The mix of Cobuquq original Xhosa- Khoena moved southwards to the Zuurveld where they joined up with Inqua refugees and the Gonaqua. Here they formed the Gqenukwebe. At the time of the arrival these Gonaqua Xhosa and the Gonaqua themselves fought in resistance together against the Europeans. One thinks here of the alliance between Chiefs Chungwa and Klaas and David Stuurman. The highly Nguni influenced remnant Xhosa that remained alongside the abeThembu saw a Kingdom, the house of Phalo emerge. It would later split into new Xhosa polity’s – the Rharabe and Gqaika. It was in the context of a clash between two contenders for the Xhosa leadership that the Inqua Khoena tribe made a huge miscalculation resulting in their demise. They took a decision to back the losing contender and as a result were consumed by the House of Phalo. Some became refugees and were incorporated into the older Xhosa-Khoena Gqenukwebe The Gqenukwebe name itself is derived from Gonaqua. It is unfortunate and a corruption of the facts and complexities of interactions between Nguni and original Xhosa, and Khoena, San and mixed Khoena-Xhosa in the Eastern Cape that these events long before the arrival of the Europeans, are presented crudely in the European narrative as a violent ‘black’ invasion that destroyed the Khoena and San in the territory of the South Eastern Cape. The Europeans have always argued that they did not force out the Khoena or wipe out the Cape San and have presented ahistorical accounts of a relatively people-free land in which previous inhabitants were wiped out by black invaders from the north. This is blatantly untrue. The Cape San lived beyond the seaboard territories in the mountainous areas and numbered in the region of 30 000. To the South beyond the Gonaqua there were many Khoena tribal formation right down into the Cape Peninsula that were prosperous sheep and cattle farmers – Hoengeyqua, Gamtoos, Hessequa, Outaniqua, Attaqua, Chainouqua, Cochouqua, Goringhaiqua, Gorachouqua, Goringhaicona, Guriqua and other smaller offshoots of these. On the western seaboard and inland were the Guriqua or Grigriqua also known as the Chariguriqua, and then the Namaqua. The ethnocide visited on these peoples by the Europeans is well recorded. The genocide against the Cape San or /Xam is also well recorded. The violent expulsion of Indigenes and the destruction of their social infrastructure and their economy was a crime against humanity. Once conquering Indigenes those who were not killed or escaped northwards as refugees were turned into farm labourers little different to slavery while others were conscripted into militia called Commandos. The pacified Khoena were turned into efficient killing machines in these Commandos and were effectively used in the genocide campaigns against the free resisting Indigenes. IN BRIEF SUMMARY: One thing that is agreed among inter-disciplinary scholars who have studied the Khoena is that events of catalytic importance happened around 2,200 – 2,500 years ago in the region of the Kalahari and it’s perimeter (also called the Northwest Circle) in Southern Africa whereby one branch of the San were engaged by external forces from East Africa with older links to North Africa and beyond which gave birth to the Khoena of the Kalahari and perimeter.